From my bed I could see stars still in the sky through one window but the marbles turning a deep crimson in the other window so I knew sunrise was not far away. I snuck out, grabbed the camera, put my shoes on and stepped outside… to a mouthful of flies that buzzed and swarmed and got in my eyes and up my nose and in my hair. Aaaaarrrrggghhhh. Snapped a few photos before going to get dressed and spray myself with Bushman. Dad had already disappeared into the Marbles for sunrise so I wandered off to find a vantage point of my own. I did a full lap right around the two main areas and had a lovely wander in the peace and quiet of early morning (although as soon as the sky coloured it started to heat up). 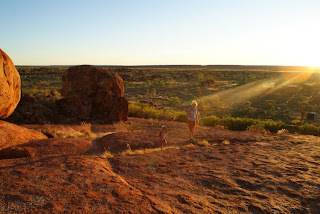 When I headed back to the main big pile near our camp area Jordy and Mum were up the top watching the sun rise. Jordy was having a ball exploring the rocks and “seeing EVERYthing up high.” He has no fear at all and thinks he can climb like spiderman. 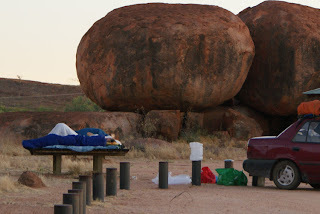 These guys cracked me up- they had a great spot right under one of the best areas and had obviously made the effort to be here for sunrise.... but i think they had a few too many last night cos the sun was rising and the marbles were glowing and they were still snoring. I was tempted to wake them just in case they were going to be totally bummed they missed it all..... but instead i just let them sleep. We had heard from John (another camper at Mount Isa that has been through here a bit) that Banka Banka Station was nice and had great facilities and yummy spring water (the rest of the bore water around here has a high lime or calcium content which is not all that great to store in your tanks even though it tastes alright). He was right and the camp area here is lovely and only $8 an adult. Lots and lots of prickle-free grass (which also means we can avoid the ants), decent shade, water sprinklers for the kids (and us) to run though, and a kiosk with beer and a place to chat etc. I did not expect there to be washing machines but there are, and they are only $2 a load. 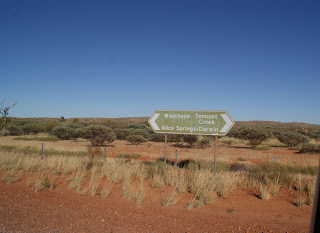 There was also a sign for a swimming waterhole and a lookout but we decided to wait out the heat before going for a look. I am glad we did cos while the view over the station from the lookout was nice there was a sign up the hill (once you’d already climbed up) to say that the waterhole was another 1.6km. LOL! Not today. So back down the hill, Jordy gave the donkey a pat, and then got dinner prepped. Around 5:30 the station managers wandered over and opened up the kiosk so Tim wandered over for a beer. We chatted to a few other campers. One couple, Barb and Arthur, are heading to Daly Waters to work at the pub and they also know John and his family (from Mount Isa) so it was really nice to be meeting up with people that know other people we have met and spoken to. Bathed the kids in a bucket before a quick dinner of roast chicken legs and vegies on the weber. We had to rush cos they have a slide presentation on at 7 over near the kiosk with photos and stories about how the station works. I found it really interesting and would have liked to stay for all it but the kids had enough and wanted to go home for bed. Tim could actually lay in bed while he was putting Jordy to sleep and see them cracking the whip and divining for water. 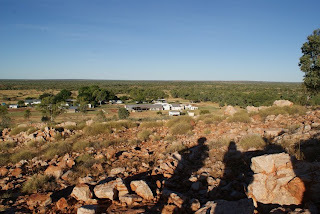 We all sat outside again and watched for shooting stars and listened to the rumble of road trains passing by.